Yamaha Commercial Audio Systems, Inc. has announced the launch of the new CL Series of digital consoles. The three consoles are making their official debut at the ProLight+Sound Expo in Frankfurt, Germany. The Yamaha CL Series is a Dante network-based console featuring remote I/O for a faster, more responsive solution. All three CL models in the Centralogic™ series, only differentiated by frame size and input capability, feature 24 mix buses, 8 matrix buses, plus stereo and mono outputs, and 16 DCAs. The footprint of all three CL consoles is small, yet powerful and has been developed for sound reinforcement applications such as performing arts venues, theaters, houses of worship, touring, and remote broadcast. 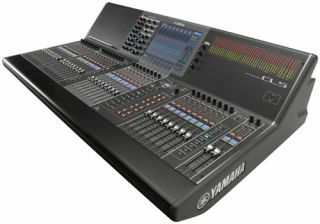 The Yamaha CL5 mix capacity is 72 mono + 8 stereo inputs (64 channels through Dante and 8 local), with 34 faders (16 on the left, 8 Centralogic, and 8 right plus stereo and mono masters). The CL5 also includes built-in output metering. The CL3 is a 64 mono input system, with 8 stereo inputs, and 26 faders (16 left, 8 Centralogic center, plus masters). The CL1 console is a 48-mono + 8 stereo inputs, and 16 faders plus two master faders (8 left and 8 Centralogic center, plus masters). All models feature 16 DCAs, channel encoders and support 48kHz and 44.1kHz sampling rates. An optional meter bridge is available for the CL3 and CL1 consoles. The CL5 and CL3 feature a built-in shelf for an iPad, and the CL1 has a shelf for an iPod. All CL consoles are configured with a top panel center section with a comprehensive selected channel section, a new 16-bit color LED back-lit touch screen, four User-Defined Knobs, a built-in help system, 2-track USB recorder/player section, and more. The CL Series features 16 31-band GEQs, an 8U effects rack and a new 8U Premium Rack including Rupert Neve Designs Portico 5043 Compressor and Portico 5033 EQ as well as new Yamaha VCM compressors and EQs. Rupert Neve, who approved the 5033 and 5043 in the Premium Rack during its initial evaluation, called it ‘very sweet sounding’ and ‘indistinguishable from its hardware equivalent’. Additional console features include simultaneous CL Editor/StageMix connection, multi-track recording via Dante Virtual Soundcard software, and File Converter Software for CL, PM5D, M7CL and LS9 consoles. A new recording software from Steinberg dubbed “Nuendo Live”, optimized for live recording and playback transport, will also be bundled with the console. CL Editor for Mac and PC as well as StageMix for iPad will be available for the series free of charge. The fader sections of all CL consoles features new self-lit key tops, channel name and color bar visible in sunlight, new fader caps and a smoother drive circuit. The Centralogic section also features Undo and Preview keys for Scene Memory, fader bank select, and 16 user defined keys. The CL console’s back panel consists of dual Dante ports, 3 MY card slots, work clock I/O, MIDI I/O, AES/EBU digital out, 8 Analog Omni ins/outs, 5-in/5-out GPI, and an external PW800W PSU connection. Targeted MSRP for the Yamaha CL5, CL3, and CL1 is $27,499, $21,999 and $14,999, respectively. The Rio3224-D has a targeted MSRP of $8,499 and the Rio1608-D has a targeted MSRP of $4,799. The optional meter bridge for the CL3 and CL1 has a targeted MSRP $1,199. The Yamaha CL5 and Rio3224-D will be available in late Spring 2012, and the CL3, CL1, and Rio1608-D will be available in late summer 2012. Yamaha Commercial Audio Systems, Inc. has also announced a major update for the StageMix iPad App available for Yamaha M7CL and LS9 digital consoles. StageMix Version 3 enables greater control and ease-of-use in live sound and sound reinforcement applications such as houses of worship and performing arts centers. StageMix Version 3 makes its official debut at ProLight+Sound in Frankfurt. In 2010, Yamaha released the first application of the StageMix iPad App for the M7CL console, allowing engineers to quickly adjust monitor mixes from the performance position onstage or anywhere in the audience immediately hearing the effects of the adjustments. In 2011, the Company released a similar StageMix iPad App for use with the LS9 console. The StageMix App provides control and flexibility for both digital mixing consoles and enables the mixing engineer to freely adjust console parameters and sound levels by wireless control, rather than at the mix position. Channel Pan; Send Levels in Meter Bridge; Tap Tempo; Edit Mixer Setting (i.e. IP and MAC Addresses); Bank Navigation in Long Faders mode; Selectable Input and Output Meter Positions; EQ Type I / II button in EQ screen; HPF ON button is always available in EQ screen; and DCA Faders (M7CL only). StageMix Version 3 for the M7CL or LS9 will be available in April 2012 and can be downloaded free of charge via the Apple iTunes Store.